Natural Biogreen foam is made on a base of castor oil with added Aloe Vera, which increases the hygiene properties of the mattress by destroying mites and bacteria and brings a piece of nature into your bedroom. The mattress has seven zones and anti-sore cross-section (something commonly used in hospital beds), bringing air under the body, allowing the body to dry better when sweating and preventing bed sores. The subtle, square cross-section exactly copies the spine and supports it to the same extent. 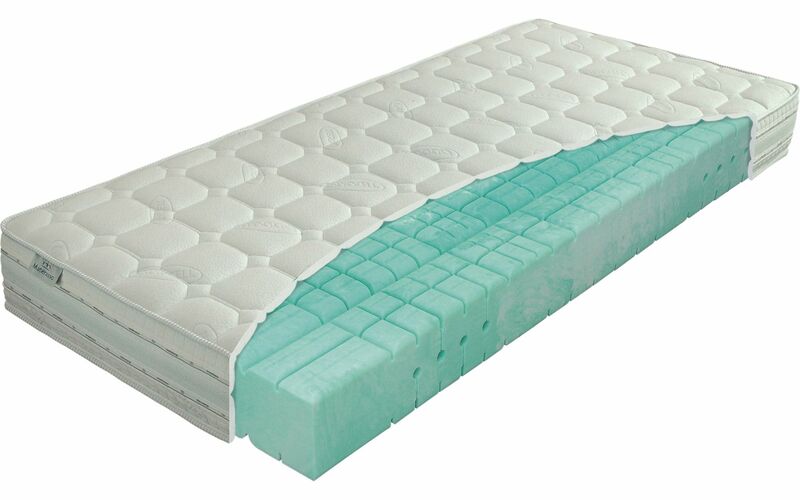 There are ventilation channels in the centre of the core, ensuring perfect ventilation of the mattress. The Lyocell cover contains natural wood cellulose fibres, which absorb and carry away moisture. The fabric uses wadding with high-grammage hollow fibre, which carries away moisture from the cover, thus increasing the hygiene level of the mattress. 3D fabric is stitched into the flanks of the cover to ensure maximum drainage of moisture from the core of the mattress.